First Presbyterian Church of Jeffersonville is a designated Earth-Care congregation. Follow this link for more information how your church can become designated as an Earth-Care congregation. See how much electricity is being generated by the 1st Prez Solar Energy Generating System. Download the Spring 2019(Lent) edition of "The Window,"
Follow this link to sign up for preparing drinks for the Fellowship time which immediately follows the Sunday worship service. This link may also be found on the Hospitality page found under the About Us/Groups & Committees link. 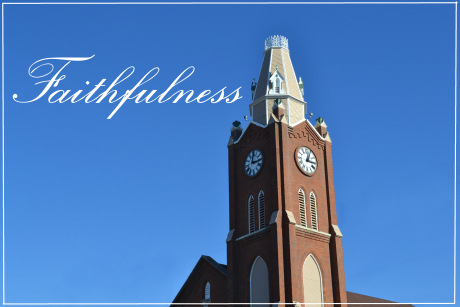 We are a big-hearted church in the heart of a small town, serving those who call this church their home, serving the community that's been home to this congregation since 1830, serving the larger world through denominational and mission connections, and above all, serving God through our Lord, Jesus Christ. Hope Chest Gifts... for the month of April supports the Community Kitchen. Suggested donations large cans of vegetables or fruit. Please leave your contributions in the Hope Chest located in the 1st Prez Atrium. For those who prefer not to shop, Hope Chest donations are availble in the pew racks and the table in the Chapel. Presbyterian Women are going to visit the ladies & children at St Elizabeth at 6:30 pm on April 23. All women are invited. Contact Beth Snyder at the church office for additional information. The Men's Group will have their next meeting at Adrienne's Cafe on Saturday,March 16, beginning at 8:30 am. Contact Doyle Criswell at the church office for additional information. Southern Indiana Night at the Bats is scheduled for June 14 with a start time of 7 pm. We will be in section 116 directly behind home plate at the top of the (covered) section.Twenty tickets have been ordered. Tickets are $8 each. Contact Eric Moore to reserve yours today. The coat project is in full swing. We need all kinds of clothing which will keep people warm, including coats, jackets, sweatshirts, sweaters, hats, gloves, blankets, etc. There is a special need for children's and large sizes. Donations may be left at the church in the atrium. Jeffersonville's Winter Farmer's Market is is now in the Taggart Hall gym on Saturday mornings through Memorial Day. Click on Announcements to view the weekly calendar and for additional information for events at 1st Prez.